Sometimes, I can be a little dramatic. I’m not proud of this. It just happens. My Italian side decides to flip a switch, and the drama starts coming out of my pores. It’s like watching a train wreck. Yesterday I woke up in one of those moods where everything – and I really mean everything – made me feel like I was going to lose my mind. I woke up, rolled out of bed, and seemed to be on a certain path of emotional self-destruction. We’re not talking about big and terrible events that sent me into dramatic upheaval, but instead, basic things. I made myself eggs. I wanted to put salsa on my eggs. I love salsa on my eggs. I opened the fridge. I couldn’t find the salsa. I almost cried…over salsa. This is never a good sign. Big, glaring red flag. The second emotional outburst of the day occurred when I tried to purchase a piece of camera equipment to try out. The website wouldn’t accept my Visa number. This happened three times in a row. I screamed. That is right, you read that correctly. That sentence did not say “I wanted to scream,” but in fact just said “I screamed.” Audibly. Totally not a good sign. Hmm. Descriptive. Also, one would have to cry a lot of tears in order to fill it with a pool big enough to sit in. Oh, whoa. I said LIVE IN. Have I never heard of trench foot? Curious. My darling husband did not respond to my emotional outburst. Could I blame him? What is there to say to a woman who is threatening a life of solitude and tear-soaked loneliness over her husband’s craving for cookies? Not much. Not much at all. Bless my husband. Seriously. It was at this point I realized today was not worth crying over. What is that old saying? Don’t cry over spilled salsa? Something like that. I looked at my flowery and overdramatic G-chat responses and laughed. I needed to turn this day around. STAT. After consuming roughly half the world’s supply of kale chips (this helps emotional situations), I decided it was time to 1) Shower. 2) Put on pants. 3) Venture out into the world. It was 75 degrees and sunny. No one needed to be screaming at a computer screen in this weather. While taking a shower, I started day dreaming about a post that I saw on Shutterbean. There was a strawberries, honey and lime over ice cream situation. Also, yes, I do daydream about food in the shower. I’m not sure if this is normal. Since I’m still technically doing my 30 days of paleo eating, the ice cream part of the recipe was a no go. 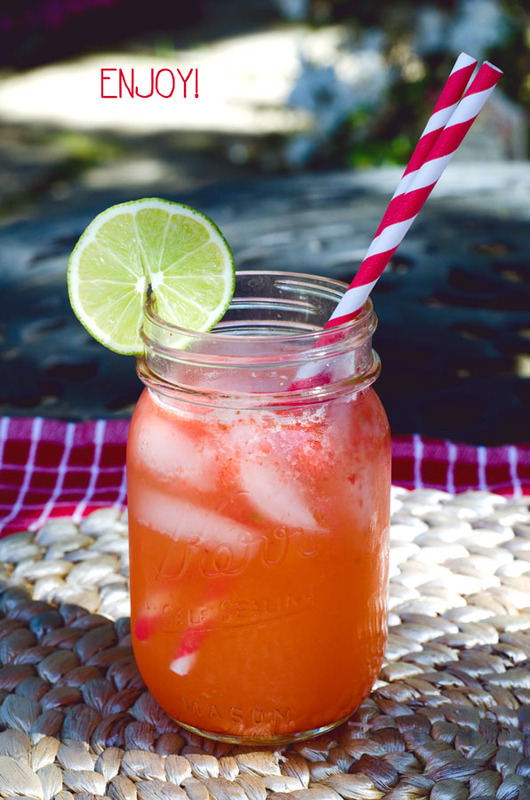 However, I could totally fashion this strawberry, honey and lime situation into a fine and refreshing cocktail. How my brain rationalizes that ice cream is not okay to eat while eating paleo, yet vodka is fine, is slightly suspicious. I was so excited over this idea I threw my sopping wet hair into a bun, hopped into yoga pants and hobbled into Trader Joes looking an eye-twitch short of crazy. It turns out when you’re having the kind of day that escalates to a dramatic peak of you threatening to lock your perfectly fine self into a tear-soaked closet, the promise of a refreshing cocktail is a serious motivator. If you’re wondering, I totally picked up some eggs too. I’m that kind of gal. Also, my husband kind of deserves cookies. I used the Caps Lock. It got serious. Ugh. I need to chill the heck out. I came home and I got to work. Strawberries were washed and sliced. Honey and lime zest came together into a syrup. This syrup soaked itself into the strawberries. Strawberries drenched in honey-lime syrup were made into a puree. This puree was put into a mason jar with sparkling water, an extra squeeze of lime and a little bit of vodka. The vodka in this recipe is totally optional. I suspect your kids or your non-drinking-pregnant-lady friends would totally groove on this recipe without the booze. It’s super refreshing! 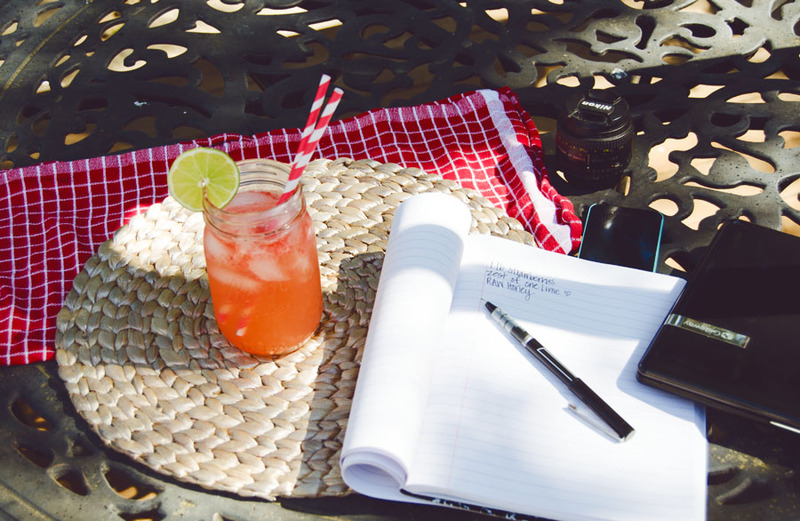 After I finished whipping up my beverage, I sat in the wonderfully sunny weather with a composition book in hand. Writing. Sipping (“recipe testing”). Putting pen to paper. Soaking up vitamin D. Not bad. Not bad at all. What was I freaking out over earlier? I just needed to take a breath, slow things down, and lay off the Caps Lock. It’s amazing how much you can turn your day around with the right intentions (and maybe a spritzer). It turns out cocktails in the sun trump crying in closets EVERY TIME. Powerful life lessons. It’s serious stuff. Happy Friday, Friends! Wishing you a dramatically AWESOME weekend! 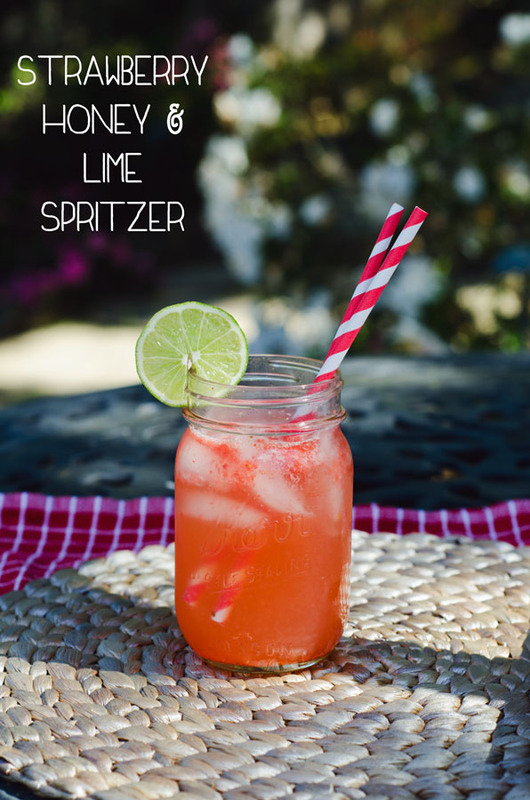 Get your spritz on! 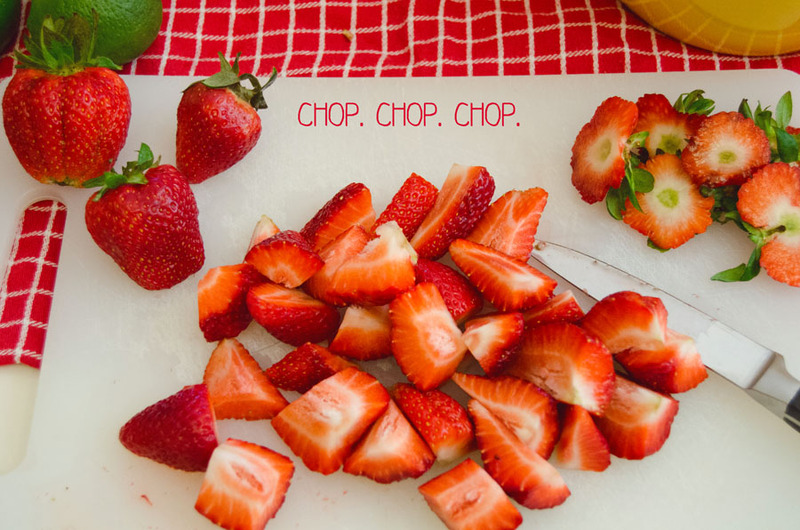 Wash and chop all of your strawberries, then set them aside in a heatproof bowl. Measure out your raw honey and add it to a small sauce pan with your lime zest. 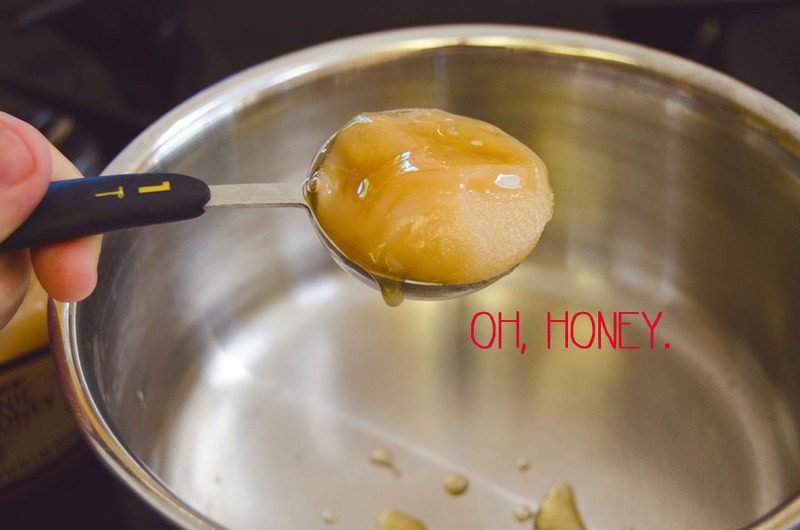 Heat your honey over low heat until the mixture starts to bubble. Allow it to bubble for 1 to 2 minutes while stirring and then remove it from the heat. 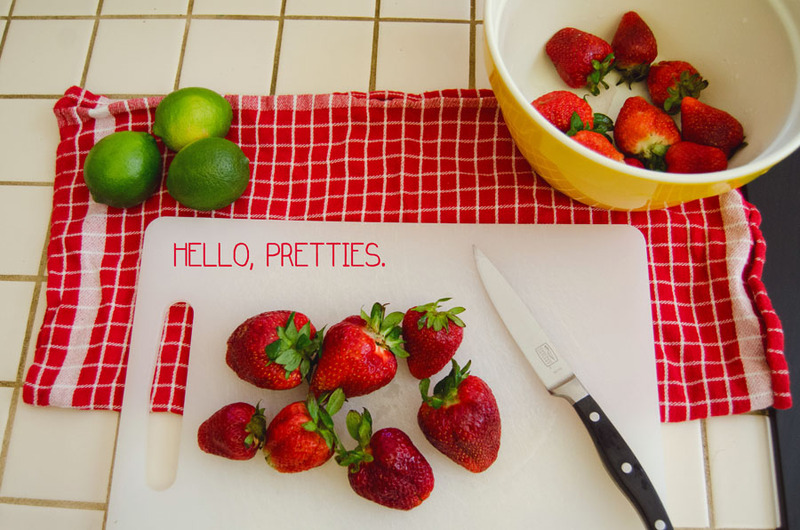 Pour the hot honey and lime syrup over your strawberries and stir together until all of your strawberries are coated. Allow this mixture to sit for at least 20 minutes. 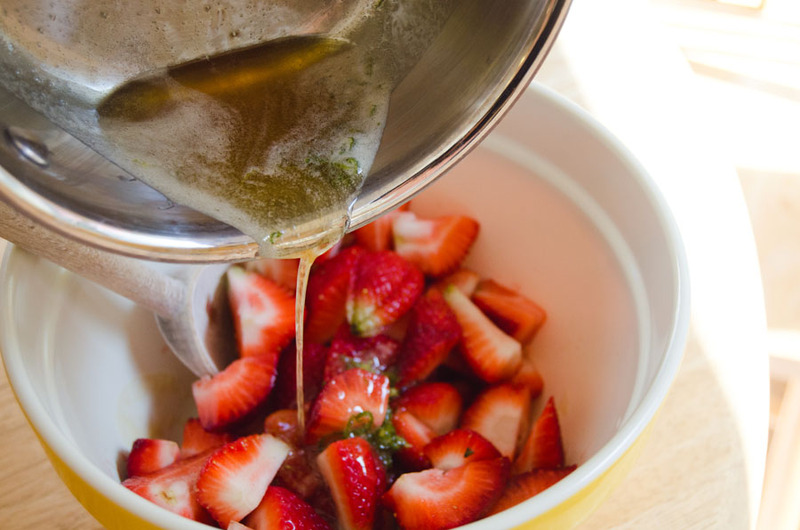 Your strawberries will start to absorb the liquid and become soft and syrupy. 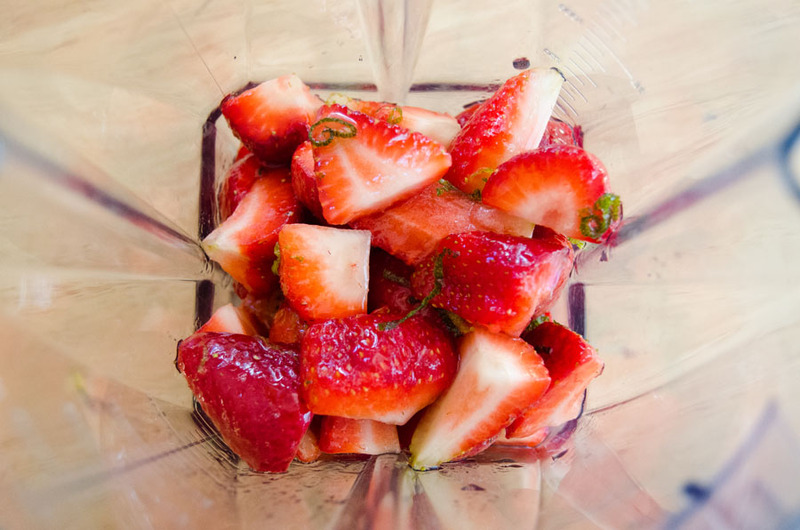 Once the strawberries are done, you can add them to a blender. Blend together until a puree forms. This will only take 30 seconds or so. To assemble your cocktail you will need a glass full of ice, half of a lime and your shot of vodka. You will also need your sparkling water. I simply used water made with my soda stream, but you can use tonic water if that is what you have on hand. Pour your puree into the bottom of the glass over your ice cubes. Now add your shot of vodka. If you like your drink to be a little on the tart side you can add the juice from 1/2 of a lime. Fill the remainder of your glass with sparkling water and stir. Garnish with a fresh lime wedge and enjoy! Oh yes, I’ve had CAP LOCK days like this as well. I don’t usually rectify them in such a valiant way with yummy cocktails, but maybe you have unlocked the secret to Cap-lock-free days! Great post – made me lol! 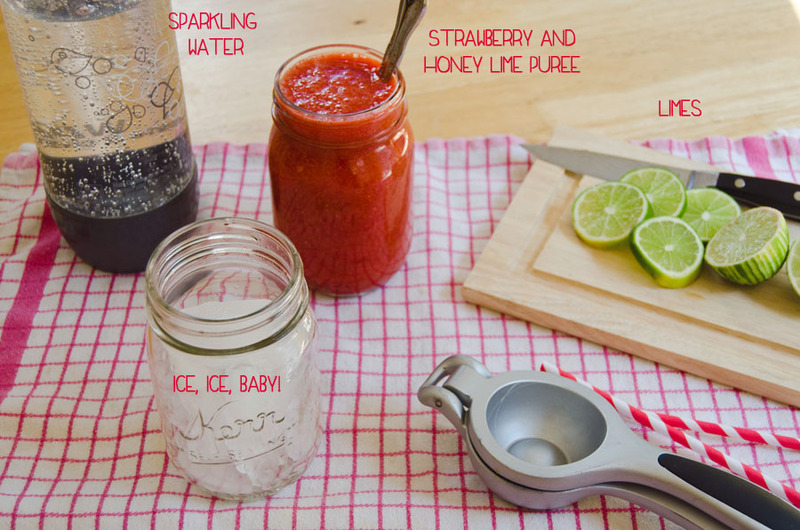 Thanks SO much for having a recipe with the Sodastream sparkling water! 🙂 Would love some more ‘healthy’ ways to make flavored sparkling waters in the future without all the sugar…. Love your blog!!! This looks fantastic! So perfect for spring. We’d love for you to link it up with The Hopeless Housewife link party. Thanks so much Erika! I will for sure check out the link up. Oh my Gosh, my recipe today is almost the same thing but I didn’t even see this recipe of yours till today when it popped up on the “you might also like” of your zucchini chocolate bread. Lol. Welp, Gina, you’ve pretty much described a (more dramatic) day in my life, too, and I’m happy to hear you overcame the emotions and made something so wonderful. Honestly, this drink sounds perfect for the hot weather we’ve been having in Texas, and I’m down for anything that suggests the addition of vodka. Soooo… yeah. Nice work! I just wanted to say thank u. U made me laugh, yr recipe sounds divine and u sound awesome. Refreshing on many levels. I generally hardly ever surf the net…just happened to look up spritzers in response to discovering an Aperol spritzer at a market yday……..